Hand Scratch Recipes : Asian Inspired Summer Meal…great for kids too! Asian Inspired Summer Meal…great for kids too! The textures and dynamic flavors of Asian food, have always made it one of my favorites. 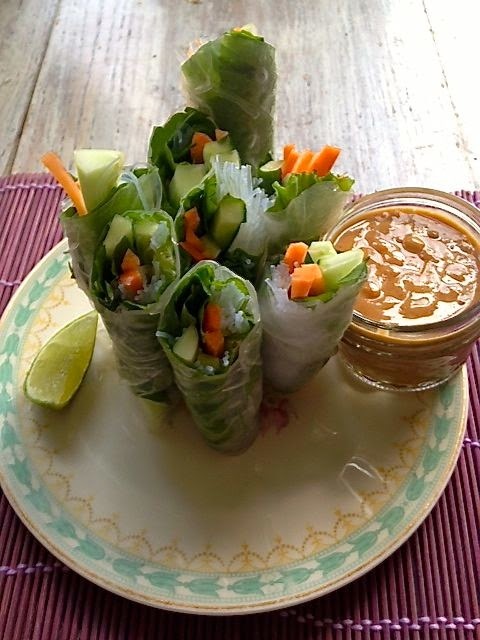 On a hot summer day, cool summer rolls and a simple stir fry entree are light and don't leave you unable to get out of your seat. In fall and winter, a spicy Phó or Tom Yum soup warms you from your belly to your soul, and never fails to be sweet, tangy and salty, hitting every area of tastebuds on your tongue. My inspiration for these recipes, was once again the garden fresh lettuce, green beans and snow peas from my parents', Piney Wood Hill Gardens, cucumbers that I grew with the help from my neighbors Claire and Tim's green thumbs and garden space, and basil and mint from my own garden. The carrots I picked up today at the Monument Square Farmer's Market, here in Portland, and the chicken also local, from Mainely Poultry. I also drew a bit of inspiration and motivation from my daughter Zsuleikah. Green beans are her favorite vegetable, and getting a nearly-four year old to eat vegetables, at least mine, is no small feat. One of our favorite local restaurants is Empire Bar & Grill , where she can eat a whole plate of their garlic green beans. This took some time for me to prepare. But with a fridge full of fresh veggies, most of the minutes passed as I decided exactly what veggies would be included in these recipes, and what flavors I wanted to come through. I would say all in all, from the Summer Rolls to the finished entree and design, an hour and a half tops. But first a message from my preschooler…your kids will love these! Makes 4 spring rolls, 8 halves. Wash all your vegetables and herbs. I would also wash all my veggies for the other two recipes at this point. See below for what you will need. Prepare vermicelli as directed on package. (Basically boil a pot of water, and put the noodles in for about 4-5 minutes. These go a long way, you don't need much. I could have used half of what is in my photo). Once cooked, drain and rinse with cold water to cool. While vermicelli is cooking Peel the cucumber and the carrot. Cut off the ends. Cut the cucumber in quarters lengthwise, and remove the seeds. Cut both carrot and cucumber into matchstick sized pieces. You may need to trim them down, but sometimes it can look nice to have a little extra hang out of one end of the summer roll. Remove leaves of basil and mint from stems. Arrange all on a plate or board for easy assembly. 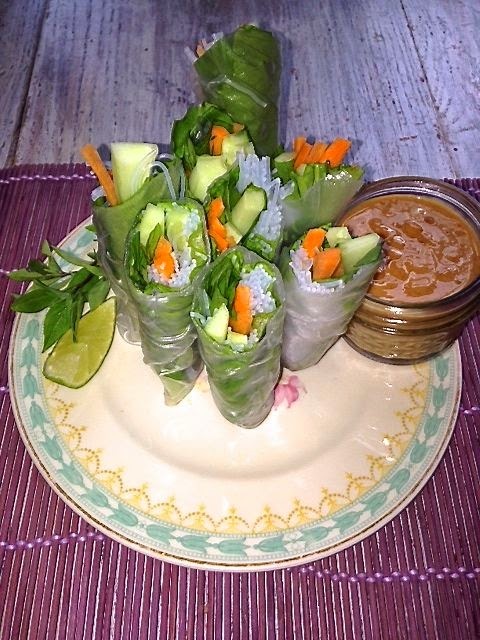 Spring roll wrappers are a little tricky, they are delicate and once they have softened, stick together easily. Follow directions on package, softening one at a time in a bowl of warm water. Then lay dampened wrapper on a plate. 1. Place lettuce leaf about 1/2 inch from edge of wrapper. 2. 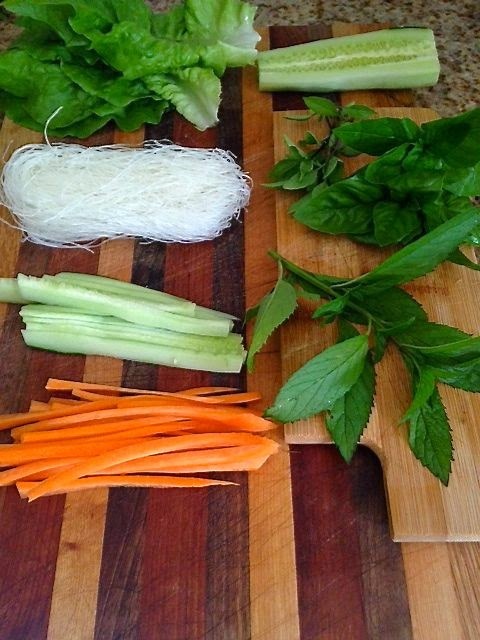 On top of the lettuce, layer on desired amount of carrot sticks, cucumber sticks, and vermicelli noodles. 3. Finish with with mint and basil leaves. 4. Then roll like a burrito. The package sometimes shows you how. Roll wrapper tightly around the filling, fold in ends, and roll to the opposite edge. Repeat these instructions until all ingredients are used. If you want fatter rolls, double up on the carrots and cucumbers. You might also want to add in a protein, such as chicken, shrimp or tofu. Cut rolls diagonally at the midpoint of roll. Arrange on plate or platter. In a bowl or glass measuring cup, combine peanut butter, juice of half a lime, sugar, and soy sauce. Stir in water and mix with a fork or small whisk until mixture is smooth and thinner. Add in sesame or peanut oil and ginger powder. Stir well. Pour into dipping bowl. Serve garnished with basil or mint and a lime wedge. 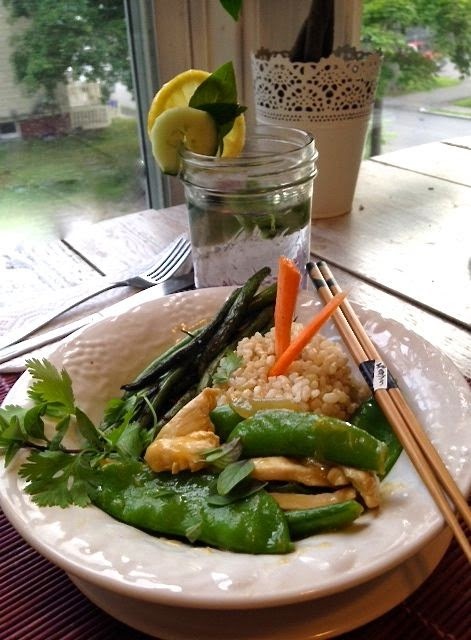 Please see previous two posts for the Garlic and Ginger Green Bean and the Lemon-Ginger Chicken and Snow Pea recipes.